October 2017 - Faculty member Andrew Schwartz, DDS, Division Director for Behavioral Science and Practice Management in the Department of General Dentistry, and alumnus Pamela Combs, DDS, ’89, were accepted into the prestigious American College of Dentists (ACD). 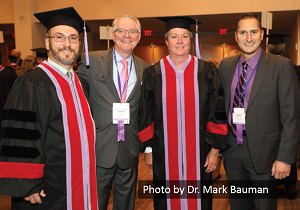 Dr. Schwartz and Dr. Combs were accepted as Fellows on October 19th, 2017 at the 2017 Convocation held at the Atlanta Marriott Marquis, Atlanta, Georgia. ACD Fellowship is by invitation only and based on a rigorous confidential peer-review system. According to ACD, the College was established "to elevate the standards of dentistry, to encourage graduate study, and to grant Fellowship to those who have done meritorious work." Dr. Schwartz joined the School of Dental Medicine in 1993 and has held many leadership roles throughout his tenure. In addition to his current role as Division Director, he has held directorships of multiple pre-doctoral courses, directorship of SDM’s year 3 clinical program, and representative and chairmanship roles on multiple school wide committees. On a national level, Dr. Schwartz holds an officer position in the American Dental Education Association Section on Practice Management. Dr. Combs continues to be an important part of the SDM community. Dr. Combs and her husband, John A. Primavera, DDS, provide The Pamela J. Combs and John Primavera Award for Community Service in Dentistry. This scholarship is awarded to a graduating student entering a general practice residency who is committed to community outreach. The contribution of Dr. Combs helps to reinforce SDM’s commitment to helping serve the surrounding population.